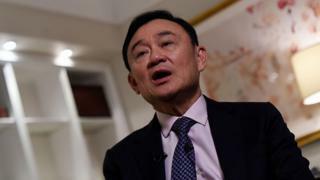 Thailand’s former prime minister Thaksin Shinawatra has alleged that the election on Sunday was plagued with “irregularities”. Mr Thaksin, who was ousted in 2006 and lives in self-imposed exile, told the BBC the inconsistencies “worried” him. The election was Thailand’s first since a military coup in 2014 removed Mr Thaksin’s sister, Yingluck Shinawatra. But there have been growing complaints about discrepancies in the voter turnout and number of ballots cast. Officials have said there were some cases of “human error” in reporting the data. Though he currently lives abroad, Mr Thaksin remains influential in Thai politics. Speaking in Hong Kong, he told BBC Thai there were “a lot of irregularities which made me worried to see the country’s politics and electoral system so backward”. Mr Thaksin cited one example, saying there were “pictures from Petchabun province where the ballot boxes were taken out and the ballot paper put back in at a local office”. “In some constituencies, the PPRP switched from losing to winning… I see it as damaging and making our country lose its credibility,” he said. In the five years since their coup the military junta and its conservative backers have tried to purge Thaksin Shinawatra from Thai politics, and failed. His name and image were barred from the election campaign, and parties risked dissolution if any links to him were found. Yet everyone knows his party, Pheu Thai, still refers to him for all important decisions. Pheu Thai supporters express open affection and nostalgia for his time as prime minister. He is a fixture they cannot remove. For now. Thai journalists flocked to Hong Kong to see him at his daughter’s wedding last Friday. Now he has given a series of interviews. His party did worse than expected in the election. It won only half the votes it got in the 2011 election, and far fewer seats, though still more than any other party. Many of his supporters suspect electoral fraud, and will take his allegations of the same seriously. But there are always infractions and irregularities, as he calls them, in Thai elections. Whether these have significantly altered the overall result is not clear yet, but it seems unlikely, despite some shoddy handling of the results by the Election Commission. A wholesale rigging of the results would not have allowed the staunchly anti-military party Future Forward to do so well. Was the election rigged? In a way, yes, because the entire electoral system was weighted so heavily in favour of the pro-military party, especially the appointed 250-seat senate. But one of the few independent monitoring groups has cited poor preparation by the authorities and inadequate voter education as a principal cause of the unexpectedly low turnout, and a reason to describe the vote as not free and fair. Mr Thaksin’s thoughts were echoed by many Thais on social media. On Monday, the hashtags “Election Commission (EC) exposed” and “cheating election” were trending. The EC later said that media had misreported the data it was giving them, and that its servers had suffered from unspecified hacking attacks. Speaking to journalists, the EC’s secretary-general, Charungvith Phumma, blamed “human error”, saying the people who put the numbers of votes in were just regular people. At the time of the 2014 coup, the military said it wanted to restore order and stability and put a stop to the street protests which have broken out repeatedly over the years. But after seizing power, it introduced a new constitution which opponents say was designed to keep pro-military forces in power.